[This is a long post – in summary Elsevier breach licences and charge readers for Open Access. I also ask the world to verify and amplify my conclusions]. A week ago I wrote to Elsevier’s Division of Universal Access about their “hybrid Open Access”. Put simply, this is where authors pay Author Processing Charges (perhaps 3-5000 USD) to have their article made “Open Access”. Because “Open Access” is a poorly defined term I asked Elsevier for information about their “hybrid Open Access”. Whether funders are getting compliance from their authors/grantees. This is not easy and depends on having a machine-readable list of all or subsets of the published literature (perhaps 40 million documents in STM) and also knowing precisely what conditions apply to the article. Since the article can exist without the context of the publisher’s web-site (or an institutional repository site) it is essential that the article carry all information sufficient to determine whether it can be redistributed, redisplayed or re-used. (Many institution repositories are seriously broken when it comes to the rights attaching to an article). I therefore wished to get a list of all articles published by Elsevier under the hybrid scheme. Since the authors have paid so much money, I would that their articles would be made accessible (accessible means discoverable and identifiable as hybrid OA). I would expect a competent publisher to have created a public list of such articles. I would also expect the articles to be identified *in the article* as hybrid. If I had spent 3000+ USD for making my article visible I this is the absolute minimum I would expect. Most publishers’ websites are extremely bad at giving contact details for formal requests. Since I happen to know that Elsevier has a “Division of Universal Access” and I happen to know its director’s name I wrote to it. Note that I regard this purely as a business transaction, similar to asking my bank for details of its policy on selling Personal Protection Insurance. Indeed , I give Elsevier the same respect and trust as I give my bank – they are providers of paid-for services, not partners or collaborators. The director wrote back by mail and on my blog. (I use the blog as a non-repudiation mechanism). http://blogs.ch.cam.ac.uk/pmr/2012/07/27/i-ask-elsevier-for-their-list-of-articles-published-as-hybrid-open-access/#comment-113189. I’ll reproduce it in full, but highlight the essential parts and comment (PMR). Please read to the end as it gets worse as you go through. “Hi Peter, and thanks for your message. Here are the answers to your 5 questions”. 1. What , if any, is Elsevier’s precise name for this scheme and where is it described? Our hybrid open access publishing scheme is not currently a branded programme. We refer to these as ‘sponsored articles’. You can read more about these here (http://www.elsevier.com/wps/find/intro.cws_home/open_access) and here (http://www.elsevier.com/wps/find/authorsview.authors/sponsoredarticles). PMR: Almost every publisher has meaningless and ambiguous phrases describing “open access”. “Sponsored access” is used by other publishers to mean “free to authors and readers sponsored by the journal”. It is impossible to determine from these words what the state of the article is. 2. How many articles in total have been published under this scheme? 2010 sponsored article numbers are available here (http://www.elsevier.com/framework_authors/Sponsoredarticles/pdfs/sponsoredarticlesNEW.pdf) and the 2011 sponsored article numbers are available here (http://www.elsevier.com/framework_authors/Sponsoredarticles/pdfs/Sponsored_Articles_2011.pdf). PMR: A total of about 2000 articles. Note that “hybrid Gold” is normally the necessary mechanism to satisfy funders unless there are “Gold” OA journals available. 3. What explicit licence, if any, is used on the articles? The majority use a bespoke license which is like a CC-NC license and described here (http://www.elsevier.com/wps/find/authors.authors/sponsoredarticles_user). 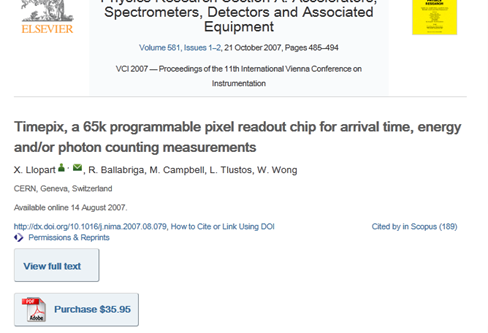 Some sponsored articles in physics only come with a CC-BY license and in these cases the CC-BY license is indicated in the body of the article at the end just before the reference, see this example (http://www.sciencedirect.com/science/article/pii/S0168900210008910). THIS IS COMPLETELY UNACCEPTABLE. The authors have purchased a CC-BY licence. Elsevier have broken this by refusing commercial re-use and distribution. “All rights reserved”. Anyone reading this would expect that the reader has no rights. This is near illiterate. “It is distributed under the terms of the Creative”. ? But – assuming that the key phrase is the next – CC-BY 3.0 FORBIDS Elsevier to apply restrictive clauses. If you were the authors, would you feel that Elsevier had given you service for your very large APC? 4. How are the articles labelled in the Elsevier journal (i.e. how is the licence and the Open Access information made apparent)? There is an open access symbol and link in the top right of the article. For an example see here (http://www.sciencedirect.com/science/article/pii/S0168900207017020). THIS IS APPALLING. This is asserted to be an Open Access article by the Director of Universal Access. And I have to pay 36 USD to read it. (I obviously cannot verify the logo as I have to pay for Open Access). 5. Where is the machine-readable list of all articles published under this scheme? I wish to download and analyze all of them. ELS: Through your affiliation with Cambridge University you are able to text mine all our content, not only the open access articles. PMR: This is nothing to do with my question. I wish a list of all the “hybrid Open Access” articles so I can determine how many – if any I am allowed to read without paying. Without such a list it is impossible to discover Elsevier’s hybrid articles. Whether this is deliberate, or simply don’t-care, Elsevier are taking tens of billions out of the academic system and giving readers little or nothing in return. At this time we do not publish a separate machine-readable list of all sponsored articles, but I will share this suggestion with appropriate colleagues involved in our various open access infrastructure projects. If you would like to conclude our earlier discussion about a bulk data download to facilitate your text mining, please do let me know. PMR: You can conclude it – I cannot. I asked for permission and you failed to give it to me. My librarians have no interest in or resources to “negotiate” with you. Elsevier break licences knowingly and deliberately charge for “open access”. [Readers will remember that Elsevier also created fake journals]. Elsevier are incompetent or uninterested in running Open Access properly. Do YOU know of any Elsevier hybrid articles? Do they have the Open Access logo mentioned above? Yes, it seems they do. So there are at least two examples of Elsevier charging for Open Access – and I’d be surprised if there weren’t more. We recently published this one in Drug Discovery Today as a sponsored article. It appears to be working fine; we’ve tried to get it released under a more liberal licence too, but without much joy so far. Anyway, this article seems to be behaving ‘correctly’ inasmuch as there’s no paywall in the way. Do non-subscribers have to pay for them? Not as far as I can tell; I’ve just downloaded it from home with no problems. Other tweets suggest similar cases of forbidden access. Starting to look like incompetence + don’t-care. I second Steve’s observation for this Open PHACTS paper. I saw the icon clearly too (though I personally find it placed wrongly, among the add-ons part of the page, rather than the main paper content), and could also read the paper as HTML fully, and download the PDF. The relevance of the Open-PHACTS paper is that we now have a sample of 1 where the authors have paid for some form of “open access” and have received some form of open access. So we now need examples where the authors paid for OA and didn’t get it. I have two. Elsevier do not seem to us CC licences for hybrid OA – they create their own terms. Whether these are crafted as a licence I don’t know. They are roughly equivalent to CC-NC-BY. A CC-BY paper should have the licence info in the paper. The Elsevier paper has a form of words , possibly pointing to the Elsevier terms. I’m not taking issue with your moral position on their metadata here. But I would say that based on what you’ve written, it’s problematic to say “Elsevier break licences knowingly and deliberately charge for “open access”” — maybe they deliberately charge, but I don’t see any licence violation. It’s possible that there’s a licence violation in the conflicting statements on the website about what licence the content is actually under, but that’s a murky issue and who knows what the legal precedent on that one is…! Also, there’s nothing weird about the statement “All rights reserved” being at the front and the CC-BY licence (with a silly but non-show-stopping typo) being at the back. This is a useful contribution. I am always prepared to be corrected. However I believe that they have changed the terms of the licence in requiring permission to be sought for commercial redistribution. Q: I want to use some work that is already licensed with Creative Commons, do I have to contact them and ask permission to use it before I use it? A: If a work is licensed with a Creative Commons (CC) licence there is no need to seek permission of the copyright owner prior to reuse of the work, as permission to reuse has already been granted by the CC licence. As long as you use the work in compliance with the terms of the particular CC licence then there is no requirement to contact the copyright owner at all. If you wish to use the work for purposes that are beyond those permitted by the terms of the CC licence e.g where a non-commercial licence applies and you wish to make use of the work commercially you should contact the copyright owner to obtain the required additional permissions. PMR: Elsevier are giving the definitive statement that permission must be sought for re-using a CC-BY licensed document for commercial purposes – and presumably thatna fee must be paid to them. PMR IANAL but I would have thought that requiring users to pay for re-use of a document that they know to be freely re-usable was very close to unacceptable trading practices. The charge for Open Access articles is clear. I can’t get the article without paying for it. Yes – assuming for now that Elsevier is not the copyright holder in the documents (ie copyright has not been transferred), I think that they cannot state that permission is required for re-use, since that would conflict logically with the CC-BY licence that the authors have agreed to. I agree this looks like a case of at least two independent cockups by Elsevier. But that does not excuse them. They have taken 6 million dollars off scholars for publishing hybrid journals – I know a lot of people who can run a website better than that for less money. And why do I have to spend my time showing the incompetence of Springer and Elsevier and doubtless the others when I start looking. They all keep telling us what a wonderful quality job they do in publishing. The impression given is that they don’t care about getting licence information correct. I absolutely disagree with ” It is in fact NOT a violation of CC-BY to charge someone for access to the content.” No access, no re-use, CC has no sense in this case. Most of all though, it needs to be way easier for the scholarly community to be able to disseminate their research the way they see best. It’s really unfortunate that people have to go jump through ridiculous hoops like this to get a straight answer. I shall continue to jump through the ridiculous hoops of “Universal Access” to highlight the harm and poor value that Elsevier provides. Straight answers are almost unknown. My point was not that Elsevier were charging for CC-BY (which is acceptable under the licence), but that they were effectively changing the licence to a bespoke one of CC-BY-NC (which I believe is not acceptable). The poor quality of the IP declaration makes it difficult to know what the actual licence of the paper is and I am relying on the authority of the Director Of Universal Access who stated that it was CC-BY. In which case changing the legal distribution terms is changing the licence. We are currently investing in a major overhaul of our open access infrastructure and until that upgrade is complete do have various systems limitations in presenting open access content. To make our open access more clear and visible in the interim we’ve created various work-arounds. You have found two problems with these – many thanks for flagging them for our attention. The article in response 3 above is correctly labelled in the body of the article as bearing a CC-BY license. The OA symbol at the top right links to a page that incorrectly signals this article can be re-used for non-commercial purposes only. This is an error in the programme which deploys the OA symbol, and we are looking into whether the OA symbol incorrectly appears on all of our sponsored physics articles. More importantly, we are looking into how to correct this. The article in response 4 has proven to be extremely interesting. I chose it randomly to illustrate the location of the OA symbol in the top right of our open access articles. After considerable investigation we have discovered that the article was not in fact published open access at all, and the OA symbol appeared on it in error. My colleagues have now corrected the programme, and the OA symbol has been removed from the article. I assure you we are keenly interested in open access publishing, but do have legacy systems that need to – and are – evolving. Your constructive comments and suggestions during this process would be, of course, very helpful and welcome. Thank you for this reply which clarifies the situation.